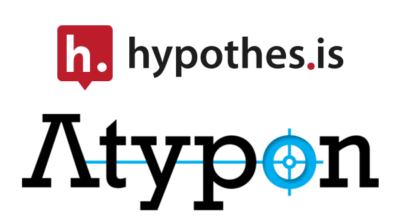 Today, Atypon and Hypothesis are announcing a collaboration to align annotation capabilities in Atypon’s new in-browser Literatum eReader with the emerging ecosystem of interoperable clients and services for annotation based open standards and technologies. A nonprofit, open source technology organization, Hypothesis’ user-friendly tool allows academics and scientists to make notes on documents they are reading and share those notes with others. More than 3.4 million Hypothesis annotations have already been created across the web. Atypon’s Literatum publishing platform hosts nearly 45% of the world’s English language scholarly journals. Through this collaboration, Atypon customers will be able to add an annotation layer to their content for the creation of additional commentary, deep-linking to supplementary resources or data, or post-publication peer review — on top of the version of record. Publishers should contact their Atypon Account Manager to discuss enabling annotation on their publications and websites. Atypon was founded in 1996 with headquarters in Santa Clara, CA, and offices worldwide. The company’s publishing platform, Literatum, provides easy-to-use tools and automated technologies that free publishers to focus on content — not technology — giving them as much control of the presentation, marketing, and sale of their online publications as they choose, as well as full support for any content type. Continual investment in innovation and development talent has helped create world-class software that allows publishers to quickly and cost-effectively build and revise content sites with their branding front and center, analyze and respond to usage patterns, manage user access, enhance content discovery and support marketing and digital commerce.